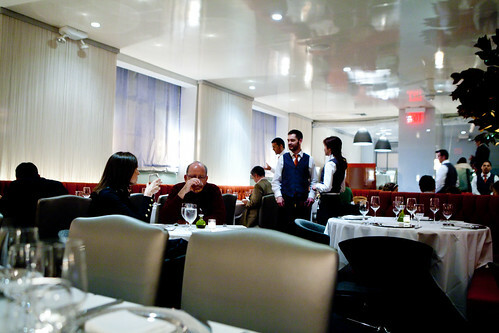 A friend of mine, Michael wanted to dine at 1* Michelin restaurants as of recent. Of that list, the one we mutually wanted to go for dinner was Convivio. Making reservations relatively last minute, I cannot get prime reservations (say 7 or 8 PM) on a Friday night and ended up going to an earlier time at 6:30 PM. As both of us arrived from the restaurant early, we sat around the bar and lounge area. I had a non-alcoholic version of the Negroni and Michael had the real Negroni. My mocktail was good. 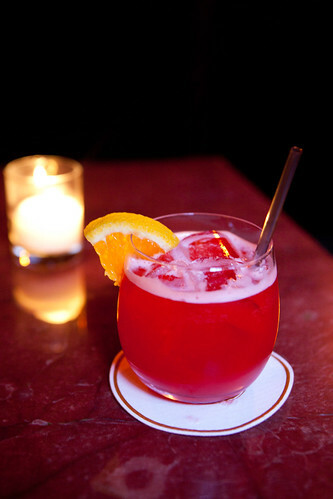 It’s made of blood orange juice, non-alcoholic and Campari. Not the most imaginative but was well made. Entering the dining room, it was about quarter-full by then. There seems to be a theme going on as to how the restaurant’s decorated (comparing to Chef White’s other restaurants: Alto (interior photo), Marea (interior photo)): modern simplicity. Tables draped with white linen tablecloths and all the seats are upholstered in leather. Of course, the most glitziest of the trio is Marea. When our server arrived and bestowed us with the menus and wine list, Michael and I settled for the 4-course prix fixe for $77. 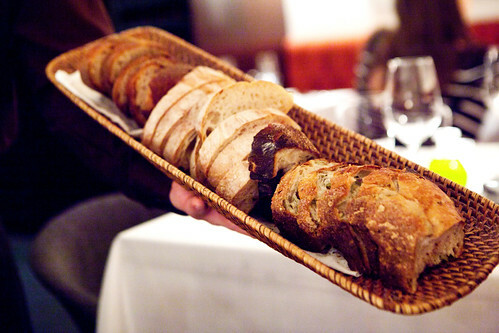 The bread selection of the evening were olive, ciabatta, whole wheat, and country bread served with a potently fruity and viscous olive oil. The slice of olive bread I had was pretty good; moist crumb and studded with proportionate amount of briny, green olives. 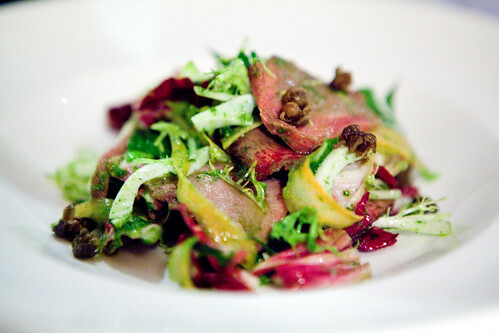 Michael’s roasted veal tongue salad was something we’re mutually interested in, as we like offal a lot. This dish didn’t disappoint. The tongue was very tender and juicy. It’s quite surprising for a tough cut of meat to be that tender by roasting. The salad and vinaigrette added some textural substance and the acid to cut through the tongue’s flavor. 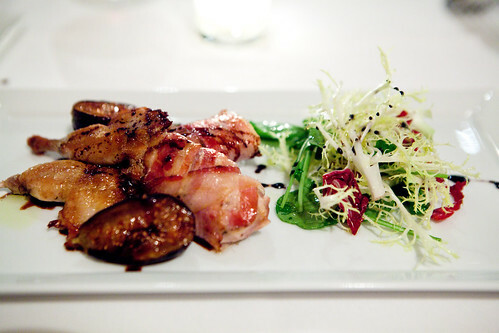 My Quaglia or roasted quail legs wrapped in pancetta, roasted figs with a side of frisee salad was equally good. The legs were cooked perfectly and the pancetta and figs added some sweetness and salinity. 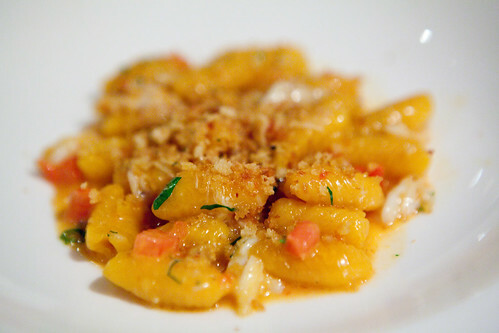 My primi, or pasta course was Malloreddus; Sardinian saffron gnocchetti with crab and sea urchin. 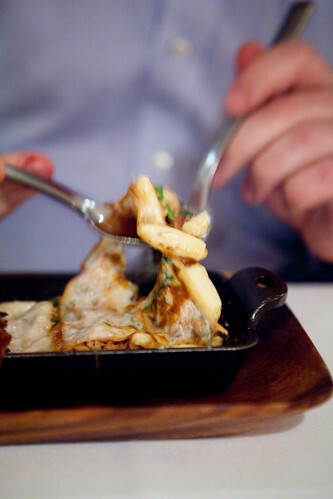 This was well made mini gnocchi – tender with a touch of al dente with a creamy sauce. I was hoping the sauce to be more richer with uni (sea urchin) like something I had at Tocqueville with its vivid orange tongues swirled around. Alas, it’s more like a hint of sweet uni that’s the background and crab flavor played a dominant role. 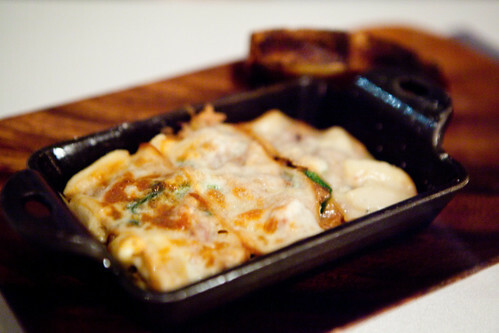 Michael’s cicatelli al forno, oven baked pasta, rabbit, Goldbar squash, with burrata that resembles as a mini version of tomato-less lasagna or a noodle casserole dish. This was good as well. What was interesting (teetering a bit too much) was the smoky flavor in the burrata cheese that lingered on my palate while tasting his dish. Onto the entree, my Capesante or pan-seared scallops with fennel and bell peppers was the least liked dish of the night. 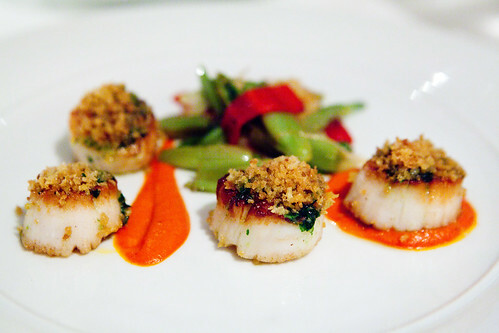 As Michael said when he tasted my dish, the kitchen went “a little too fennel happy.” For me, it was too bell pepper happy as every bite I ate I tasted that vegetable rather than the scallop. At least they properly cooked the scallop to a perfect medium-rare. Michael’s roasted Long Island duck breast was half correctly done, in our opinion. 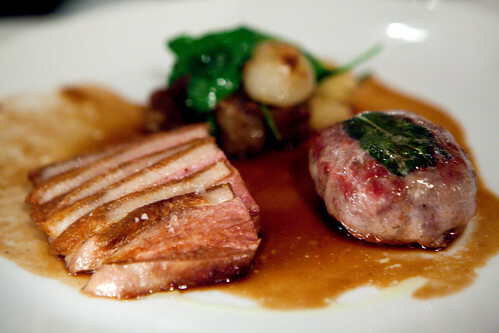 The duck breast portion of this dish was cooked to a medium-rare, which was fine. The duck sausage (made of ground duck legs and thigh meat) was rare that it’s minced filling was still soft. The sausage would benefit in terms of texture and possibly flavor if it was cooked through. The side of sweet, caramelized cippolini onions and wilted spinach was fine as well. We half-joked with our server before ordering dessert that this would be the saving grace of this meal, as we expressed our disappointment with the entrees. We ended up sharing a sweet and savory dessert. 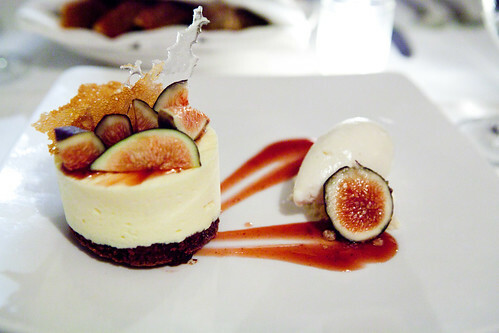 I mostly had the zabaglione semifreddo with fresh purple figs and brandy spiced ice cream. This was a good semifreddo and I do love fresh figs but they went a bit overkill with serving an ice cream with another ice cream. 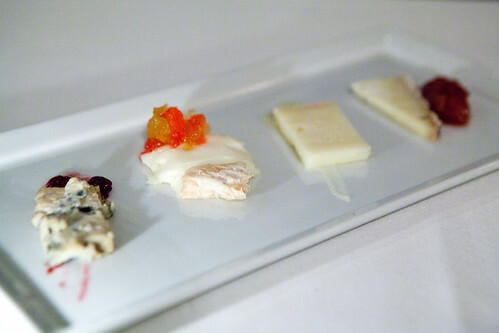 The cheese plate was overall good. Both of us loved the rich, creamy, sweet Casatica from the Lombardi region that’s topped with candied orange peel. Overall, I feel a bit disappointed that the food was inconsistent throughout the meal. If you have to imagine it like a roller coaster ride, starting with a catapult launch (the appetizers) then slowly descending from the peak (primi) to the valley (the entrees) and regained some elevation at the end (dessert). I do have to admit that the dining room was packed as we were in between the primi/entree courses, the kitchen has to catch up with the orders, and of course, the cooking won’t be paid attention as much. Service was friendly and helpful yet our server was new so she’s not too familiar with the entire menu. Danny: Duck breast is cooked to a medium rare so it won’t be tough. Chicken you can’t do because of salmonella. From my understanding of what my mother tells me, chicken is eaten less-than-fully-cooked in Asia… Having never been there, I couldn’t say whether that was just her experience or more widely done. Also, did they raise the price of their prix fixe? It was $62 when I went at the end of October, and an excellent deal imo. I must say that you missed my favorite dish there- the fusilli, which I know everyone raves about at Marea, but I think the fusilli at Convivio blows Marea’s out of the water. Convivio has not raised their prices. I wanted to try something that’s not from Marea since I’ve eaten their food twice within the past year. I found it a bit redundant to try the a similar dish (though Marea’s would be considered a bit more richer from the use of bone marrow while the richness of Convivio’s would be from caciocavallo fonduta).